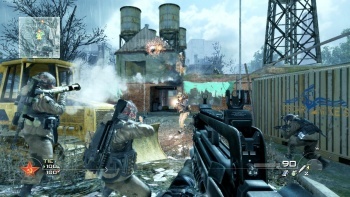 Despite all the complaints about the high price of the Modern Warfare 2 Stimulus Package, demand for the map pack has been high enough to bring the European PlayStation Network to its knees. There's an old saying that goes, "Put your money where your mouth is." It's essentially a dare to people to back up their words with actions. Because all too often, that doesn't happen: A lot of noise flows out the yaphole but when the rubber hits the road, most people will just shut up and get in line like everybody else. Why am I talking about this? Because the high price and low content of the Modern Warfare 2 Stimulus Package, a collection of five maps (two of which were recycled from the original Modern Warfare), inspired torrents of anger and complaints among gamers who felt they were being unfairly treated; yet when the DLC hit the European PlayStation Store yesterday, they jumped on it so hard and fast that the PSN tech guys still haven't been able to get it straightened out. Some customers who attempted to add money to their accounts yesterday were unable to do so, and may be unable to do so for some time to come, and a few have actually had their credit or debit cards charged for top-ups that didn't actually happen. PSN's advice at this point? Try again later, preferably in the wee hours of the morning. "As we expect traffic on PlayStation Network to be extremely high over the coming days customers should try to make any purchases outside of peak hours if at all possible (off-peak hours: morning/early afternoon Western European time)," a PSN rep wrote on the European PlayStation Blog. Having adequate funds in your account is no guarantee of a smooth ride either, as reports of problems with downloading and installing the map pack have also been reported. "As customers have the option to download all seven versions of the add-on they should identify which disc they have (disc ID can be found on the spine of the game's case) and only download the appropriate version for their disc," the message continued. "Where the download or install failed customers should attempt to re-download and install during off-peak hours if possible (off-peak hours: morning/early afternoon Western Europe time)." And this, folks, is why Activision is charging 15 bucks for a five-map update.